One of my all time favorite photos! 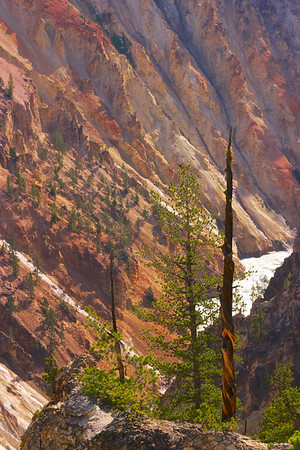 Fall morning sun glows on the walls of the Grand Canyon of the Yellowstone just after a light rain. The air was clear and the rain soaked soil saturated the color. The spectacular array of colors you see in the canyon are the result of hydrothermal alterations to the ryholit rocks that make up the canyon walls.